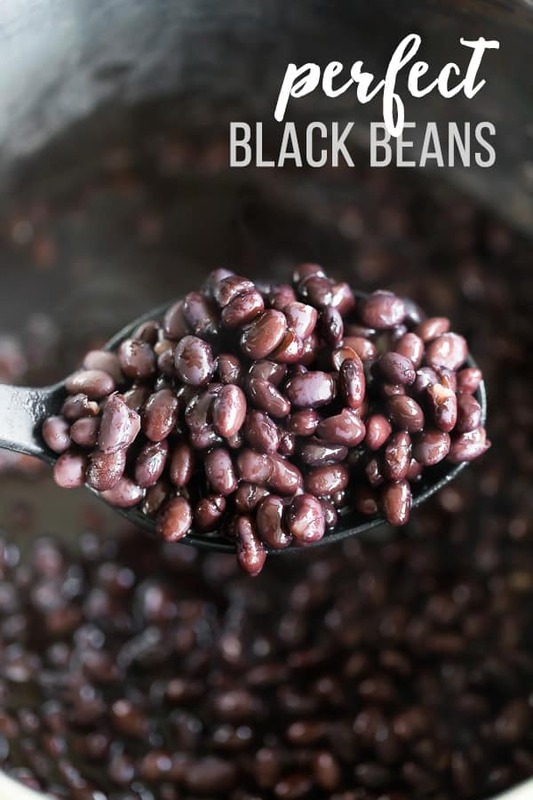 Perfect black beans- a basic, fool-proof recipe to cook your own black beans at home in the Instant Pot or on the stove top! Cooking your own black beans will save you money and tastes way better than canned. When it comes to getting a lot of bang for your buck, black beans are where it’s at! At only 2 dollars for a bag (this is Canadian dollars so it’s probably even cheaper in the US! ), you can prepare around 12 cups of cooked black beans. Not only are black beans super affordable to cook on your own, but they are deceptively easy, especially if you use an Instant Pot or pressure cooker. 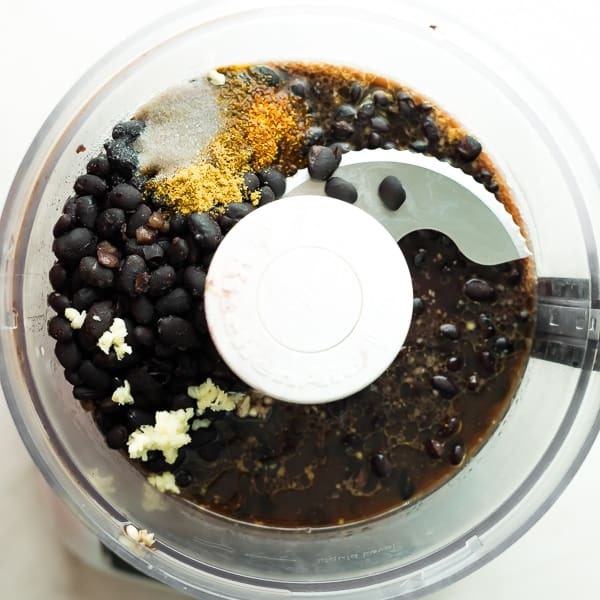 After playing around a bit, I’m sharing my simple recipe for perfect black beans. 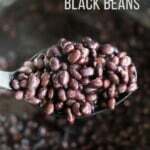 This is just a basic recipe to be used as a substitute for canned beans, but I have also included some ideas in case you want to amp up the flavor. This recipe is officially going into my rotation because YUM! So so so much tastier than canned! 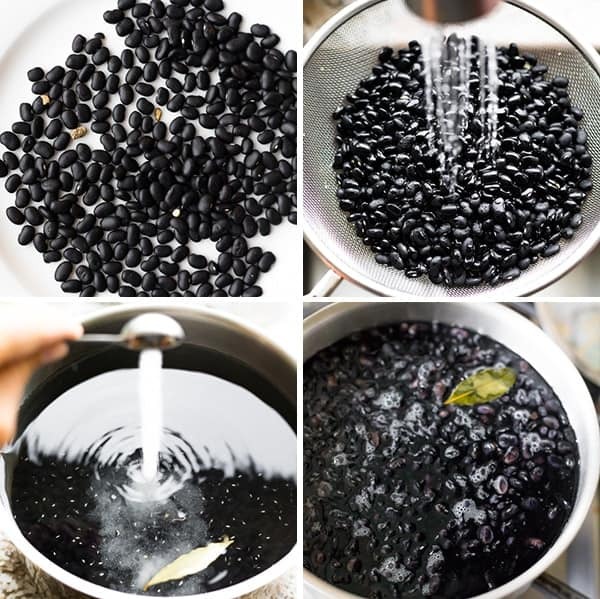 To soak or not to soak- There are two types of black bean recipes out there: soaked, and not soaked. You probably guessed I fall into camp 2, soaking just doesn’t fit my ‘lazy girl’ approach to cooking. Cook! 1.5-2 hours on the stove top, 35 min high pressure + full natural pressure release (25 min) in the Instant Pot. 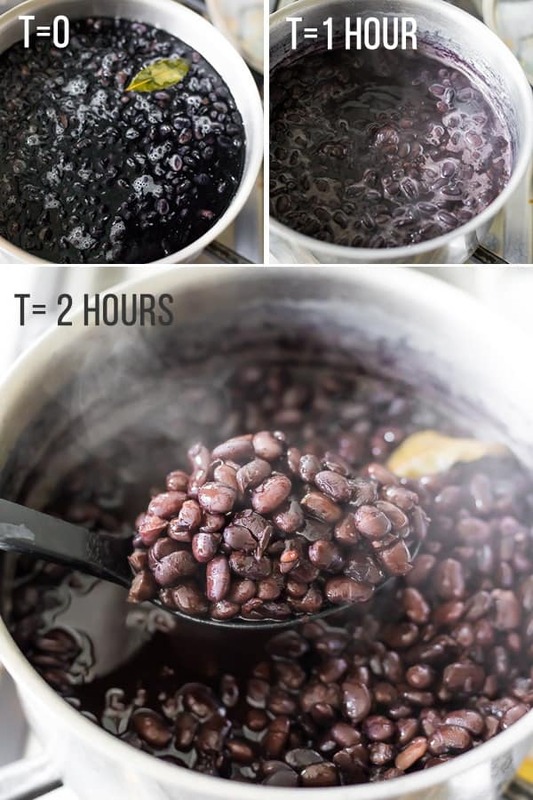 To cook these perfect black beans on the stove top, I covered with 4-5 inches of water, brought to a boil, and simmered uncovered for 1.5-2 hours. If your water reduces to the point that the beans are no longer covered, add a bit more. Cook until the skins start to peel slightly, or just pop one in your mouth and determine if they are done to your liking. I don’t like my beans firm as I find them kind of dry, so I aim for something a tiny bit more firm than canned. It’s pretty hard to beat the convenience of the Instant Pot when it comes to cooking black beans…in fact I doubt I’ll cook them on the stove top again! 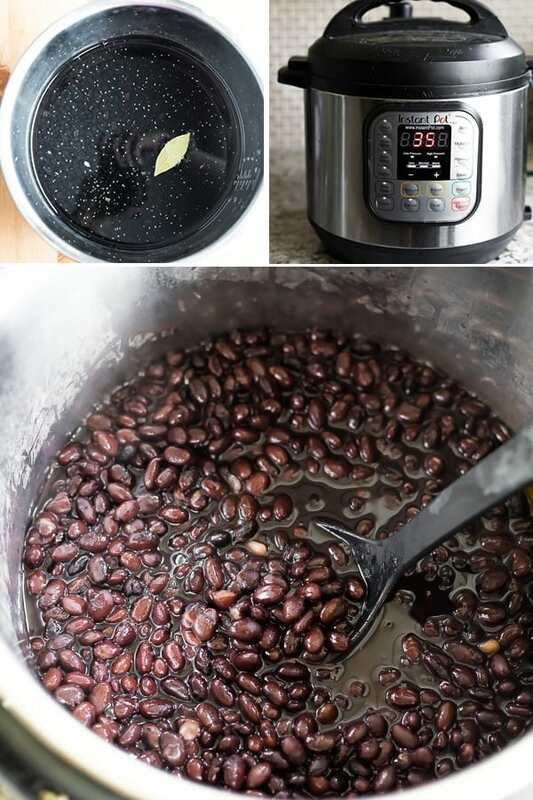 To cook these perfect black beans in the Instant Pot, follow the same prep directions as for the stove top version, then add to the IP with 4 cups of water, 1 teaspoon of salt and 1 bay leaf. Cook for 35 minutes at pressure, with a full natural pressure release. This gave me the perfect black bean texture that still had a slight chew but was not dry. after 25 or 30 minutes the beans were unevenly cooked with some beans being really dry and firm. If you want really soft black beans similar to the texture of canned, I might try for 40 minutes at pressure. and also these Grilled Veggie and Black Bean Meal Prep Bowls! Pick through black beans and remove any stones. Place rinsed beans in a pot and cover with 4-5 inches of water. Stir in 1 teaspoon of salt and 1 bay leaf. Bring to a boil, reduce heat and simmer for 1.5-2 hours, or until beans are cooked to your liking. Add more water if beans become uncovered at any point. 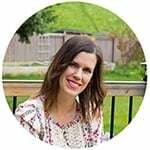 Place rinsed beans in the base of an Instant Pot. Add 4 cups of water, and stir in 1 teaspoon of salt and 1 bay leaf. Set the valve to 'sealing', then cook for 35 minutes at high pressure followed by a full natural pressure release (allow the Instant Pot to sit for approximately 25 min or until the valve drops). Up to 4 days! You can freeze leftovers if you have them! This is a recipe I would like to try. But 12 cups is a lot of beans! Can you freeze them? Hi Sheila, sorry for the confusion, the recipe makes 12 servings, but 6 cups total. I will update the recipe card. Yes, you can freeze them! We portioned out into freezer bags and stored for up to 3 months. Hope you enjoy! Can’t wait to try this with homemade refried black beans! We have never eaten many refried beans before, but they were soooo good made with these beans! Hope you enjoy!